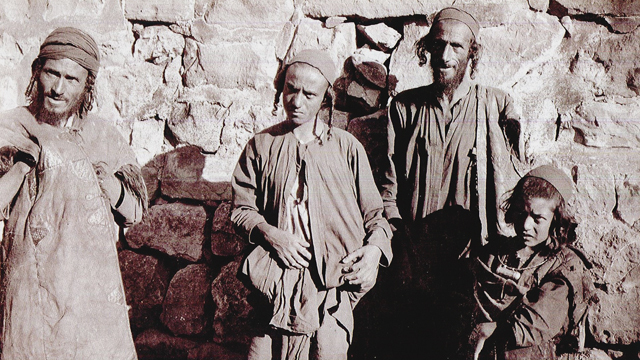 Jews from the mountain village of Maswar in northwest Yemen, 1902. Photo: Hermann Burchardt; published in the German journal Ost und West (Berlin), 1902: 340. Courtesy of Wikimedia Commons. UCLA International Institute, February 1, 2019— “Yemeni memories often run counter to the Zionist narrative and counter to much of the academic literature written by the community. 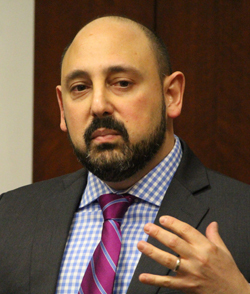 These memories represent the emergence of double consciousness that manifest in a desire to become Israeli, but to remain Yemeni,” said Ari Ariel recently at the Center for Near Eastern Studies (CNES). The academic literature on Yemeni-Jewish migration and identity is incomplete, he argued. Using migrants’ memoirs and Yemeni-Jewish cultural practices, he described the malleability of Yemeni Jews' identities in both Yemen and Israel. Ariel teaches Modern Middle Eastern Studies at the University of Iowa. He was the featured speaker at an Averroës Lecture cosponsored by CNES and the Alan D. Leve Center for Jewish Studies. Academic accounts of Yemeni-Jewish migration usually explain this migration in four ways: Messianic impulses, longing for Zion, Muslim oppression of Jews or rising Muslim-Jewish tensions. However, historical accounts provided by the speaker did not fit into these categories. In one such example, a man decided to leave Yemen to teach abroad. He arrived in New York and moved to the Lower East Side to be closer to the Jewish community. However, they did not accept him until he was able to cure the local rabbi’s son of jaundice using traditional medicine. The community embraced him, and he was able to settle comfortably. Nevertheless, his stay was short-lived and he returned to Yemen. Neither Palestine nor Israel is mentioned in this story, and the significance of migration memoirs show that the return to Yemen is not an isolated case, remarked Ariel. “Yemeni Jews traveled to various places and created numerous networks during the 19th and 20th centuries,” he noted. The singular focus on Yemeni migration to Palestine and Israel to the exclusion of all other destinations removes the significance of migration to other places, as well as the frequent return home of Yemeni migrants, claimed Ariel. “Stories of return migration require that we assess our understanding of Yemeni history as well as the history of migration to Palestine and Israel,” he commented. Yemeni-Jewish identity faces contradictory requests and constraints. “Israeli society demands that Yemeni Jews become Israeli and only allows a limited space for the preservation of a pre-migrated culture,” remarked the scholar. “Muslims, on the other hand, claim that authentic Yemeni [identity] is in opposition to Israeli identity.” Yemeni Jews caught between these positions have embraced Israel, he said, but hope to remain Yemeni at the same time. Women’s memoirs highlight the contradictions between the way that migration to Israel has changed Yemeni’s food consumption and other traditions. This prompted a call for the preservation of Yemeni food customs, but ultimately ended in the homogenization of Yemeni cuisine. “Yemeni Jews did not know or like olives; they thought they looked like goat dung,” mentioned the scholar. Many also found that their traditional food was used differently in Israel. In one account provided by Ariel, he described a Yemeni woman refugee who became sick at the sight of a Yemeni spread being placed on top of Israeli food. The preservation of Yemeni-Jewish identity in Israeli society has posed challenges for Yemeni Jews. Whether this situation changes remains to be seen. The cultural gap that this group has overcome represents a semi-acceptance of Israeli tradition and assimilation into the Israeli community, observed Ariel. However, the limited space for ethnic differences has resulted in a single, flattened Yemeni identity. “Hopefully, migrants will continue to insist on maintaining their Yemeni culture,” concluded the speaker.